HUMBOLDT, Sask. 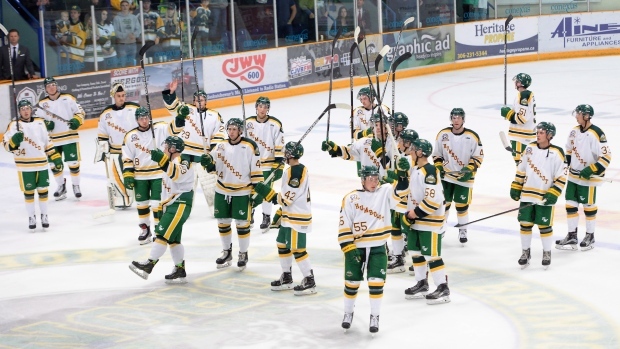 — The Humboldt Broncos tried to emerge from the grip of tragedy Wednesday night by playing some hockey and raising banners to honour all the people who were on their team bus when it crashed in April. "I just saw all the pictures of the people that passed on the bus and I just looked over at him and said: 'Sure glad your picture's not up there,'" he said. "We're the lucky ones and we don't take it for granted. Every day we are appreciative to have him with us." "In my mind, it’s kind of a new page, a new chapter in the book I guess — moving forward as a community and as a team." "I think we did right by last year’s team here."